A new study finds that the number of American children consuming fake sugar has risen 200% from 1999 to 2012. During this time period, 25% of children and more than 41% of adults in the U.S. say they consumed food and beverages containing low-calorie sweeteners (LCS). Researchers from George Washington University’s Milken Institute School of Public Health led the study, which was the first of its kind to look at the use of popular low-calorie sweeteners using the most recent data. The spike in use was striking, said lead author Allison Sylvetsky, Ph.D., an assistant professor of exercise and nutrition sciences at the Milken Institute SPH. "Just 8.7 percent of kids reported consuming low-calorie sweeteners in 1999 and 13 years later that number had risen to 25.1 percent," Sylvetsky said in a statement, adding that kids aren’t the only ones consuming more aspartame, sucralose, and saccharin. "More adults also are taking in low-calorie sweeteners in diet soft drinks and in a variety of foods and snack items. The findings are important, especially for children, because some studies suggest a link between low-calorie sweeteners and obesity, diabetes and other health issues,” she said. For the study, the investigators looked at data from 17,000 men, women, and children included in the National Health and Nutrition Evaluation Survey from 2009 to 2012. They compared their findings to studies that used data from 1999 to 2008. The most recent survey revealed that 44% of adults and 20% of children consumed low-calorie sweeteners more than once a day. 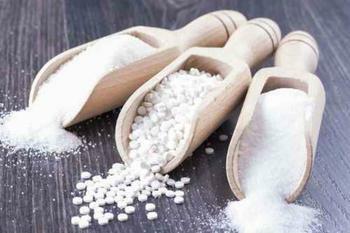 17% of adults consumed low-calorie sweeteners more than three times a day. 19% of adults with obesity compared to 13% of normal-weight adults used the products three times a day or more. 70% of the consumption happened at home. Children as young as 2 were consuming the sweeteners. The study, published in the Journal of the Academy of Nutrition and Dietetics, found that 1 in 4 U.S. children are consuming the sweeteners. Most of the time, LCS consumption happens at home. Sylvetsky says parents may choose to purchase products containing low-calorie sweeteners -- such as those labeled “light” or “low sugar" -- thinking they’re healthier than other options containing sucrose and high-fructose corn syrup. However, experts have yet to reach a consensus on the health effects of consuming products containing sugar substitutes. More research is needed on the subject. In the meantime, parents looking to reduce the amount of artificial sweeteners in their diet can “drink water instead of soda” or “sweeten a serving of plain yogurt with a little fruit,” says Sylvetsky. How much fruit juice should your child be allowed?